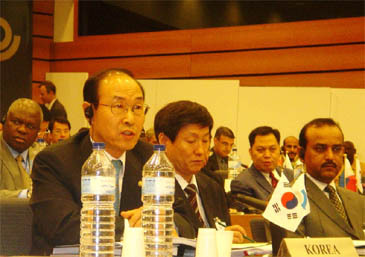 Commissioner Kim Yong-Duck (left) of Korean Customs Service (KCS) speaks at general assembly of World Customs Organization (WCO) held in Brussels in Belgium June 24, 2004. While customs procedures can have a positive impact on a country's two way trade and tourist traffic, a growing importance is being attached on ensuring coherence in customs policy formulation in advanced countries because inconsistencies in policy stances or neglect in particular areas can diminish valuable opportunities in international trade and tourism, among others, that are so vital for the national development in this globalization era. For Korea whose two-way trade volume now totals $500 billion with more than 12 million in two-way tourist traffic, we cannot hope to reap the real benefits of open trade and tourism unless we have efficient and effective customs services with transparency and international standards. 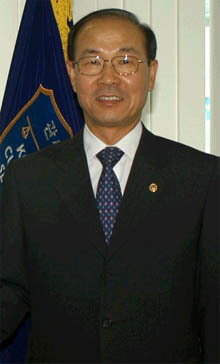 That is why customs administrations of the world countries are making all-out efforts nowadays to enhance a multi-faceted role of customs administration in revenue collection, community protection, trade facilitation and national security, says Kim Yong-Duck, commissioner of Korean Customs Service. "Such a role can be achieved only when customs offices are armed with an efficient and effective customs system of accountability, transparency and ethics," he said in an interview with IT Times. 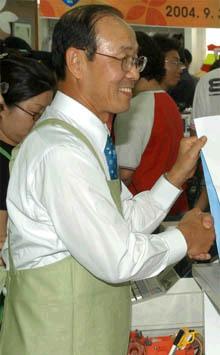 Since Kim was appointed as the country's top customs administrator in March 2003, Kim has been making a strong push for an initiative for " World's Best Customs." When asked to elaborate on World's Best Customs, Kim explained that this initiative is aimed at realizing the national vision of making Korea a business hub in Northeast Asia. With a view to translating this goal into a reality, the Korea Customs Service (KCS) has set up seven strategic action plans which included improving import and export logistic system through optimizing logistics flows and simplifying cargo handling, according to Kim. Kim is very keen in creating a business friendly customs clearance system as well as innovating passenger entry-departure system by advancing the voluntary declaration and streamlining inspection process of personal effects. He noted that more than 8 million Korean tourists are going overseas annually with 4.7 million of foreign visitor arrivals. Indications are that the two-way tourist traffic would increase at explosive pace in the years to come. Among other points Kim emphasize in his initiative for "World's Best Customs" include enhancing Clearance Service for Express Cargo by building an round-the-clock clearance system, supporting world-class express delivery companies and completing E-customs through Internet-based declaration system. "By doing so, we can create single-window system for one-stop service," he stressed underscoring the need for introduction of a Hi-Tech Surveillance System as well as a selective and intensive inspection into high-risk vessels and vehicles with a voluntary surveillance based on civil participation. Kim believes that the availability of information on Customs matters to the interested persons is one of the key elements in facilitating international trade. He noted that with a simple click on the web-site of KCS, anyone could enjoy the diverse and up-to-date information about customs service ranging from international trade, tourism and others for speedy customs clearance and facilitation. 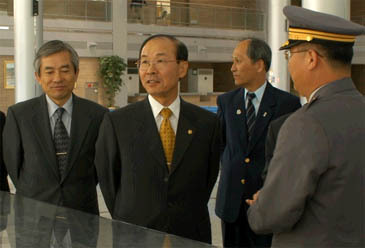 Commissioner Kim Yong-Duck (center) of Korean Customs Service (KCS) at a recent event. Improved customer service for businesses and individual taxpayers is the benefit expected from new e-customs system, which came under the spotlight recently. Kim says. The new system aims to bring significant benefits including: delivering improvements for customers, through more effective, joined-up services; improving fairness by making better use of information across Internet-based e-customs system which will help target compliance activities, thereby reducing the burden on honest taxpayers; and cracking down on those trying to abuse the system. "We are committed to ensuring that our customs administration is best placed to deliver the best possible service to taxpayers. The establishment of e-customs system, integrating the work of Customs and the Revenue, represents a major contribution to the government's public service reform agenda, aimed at delivering real service improvements for people and businesses throughout Korea," he said. "Public confidence in the customs service system is crucial," Kim stressed adding that customs electronic service delivery that supports client needs and government requirements with secure on-line access, efficient transaction and ease of communication. Customs administration has developed and maintained a strong commitment and leadership in delivering services on-line. Until recently, KCS has depended on Electronic Data Interchange (EDI) access to a broad range of customs applications for the transport, logistics and trading communities. The system will be replaced with next generation e-customs system to allow for electronic inter-agency coordination across a number of transactions. Customs will soon be using on-line technologies to work with commercial airlines and other agencies to electronically pre-clear many passengers in advance of their arrival. Customs envisages a future in which all clients will not only transact on-line, but will also have immediate access to a wide range of information and be able to interactively gain answers and access support from across customs. In this future, the boundaries will not simply be set within customs. 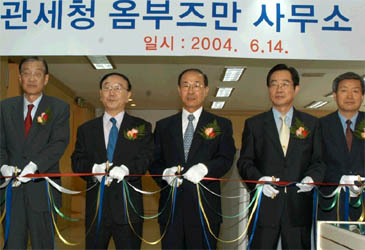 Customs would be part of a network of agencies providing combined services to the Korean public and the trading community. In moving towards this future, KCS is extending its commitment to cover an even broader range of transactions by making significant investments into new business systems and infrastructure. This investment will provide web-based transactions and information services as well as security through the use of new electronic infrastructure and information technology architecture, according to Kim. 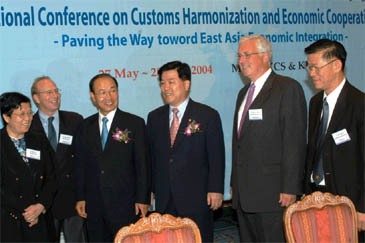 Kim then emphasized the importance of customs cooperation not only in the East Asian region but also worldwide. "Against the backdrop of ongoing tide of globalization, we are observing an increasing regionalization of the global trade and investment like European Union (EU) and North American Free Trade Agreement (NAFTA)," he pointed out. 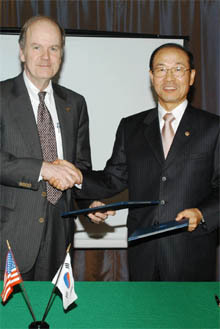 In this vein, Korea is also taking the lead in pushing for the Seoul Initiative, he said. 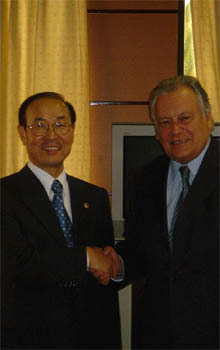 Seoul Initiative is in line with the basic spirit of Asia-Europe Meeting (ASEM), which began in 1996 to promote the economic, political, cultural and social cooperation of the two continents. In East Asia, even without a strong mechanism of trade and cooperation, the current intra-regional trade among ASEAN plus three countries accounts for about 35 percent of the region's total exports. And there is a strong consensus that a regional framework of closer economic cooperation would bolster regional development and prosperity. Seoul Initiative means that the concrete steps are being undertaken, for the first time, at the regional level including Korea, China and Japan for the Customs cooperation. If such economic cooperative arrangements are put in place in this region, I firmly believe that Asian Region will see in the not-too-distant future itself transforming in! to an economic community like EU. Fostering closer economic cooperation among nations have a positive impact on foreign investment and economic development, which will, in turn, create more jobs and enhance welfare, he said. According to Kim, regionalism has been dynamic throughout the world except Asia. The Asian region is less institutionalized than those are in Europe, Latin America, or North America. There is no Customs union in the region, or the dispute settlement mechanisms. "These things go hand in hand. Failure or neglect in one area spells disappointment in others," he said adding that tremendous gains can flow from mutually beneficial international cooperation. South Korea has emerged as a center of international customs cooperation activities, serving as a venue to reaffirm the importance of customs services to international trade, as well as solidifying cross-border friendship and cooperation. Customs commissioners from Asian and European countries, including KCS Commissioner Kim Yong-Duk, participated in the 5th ASEM Customs Commissioner Meeting held in Seoul in October last year. The two-day international conference titled: "Customs Harmonization and Economic Cooperation in East Asia," attracted more than 100 local and foreign customs officials, business executives and academic professionals from 16 nations. During the meeting, Kim put forward the Seoul Initiative, which was unanimously adopted by all the participants namely to hold a public-private sector joint conference on economic cooperation in East Asia. "The objectives of this groundbreaking conference were to facilitate and promote trade through harmonization and simplification of customs procedures in the region," Kim explained. The conference also sounded out possibility of regional economic cooperation through the creation of a free trade region in East Asia, comprising Korea, China, Japan and ASEAN members. The KCS hosted the conference under four agenda themes, focusing on customs procedures and tariff systems with main focus of the meeting being placed on exploring East Asian tariff systems, customs procedures, and rules of origin in East Asian countries. "The Seoul meeting ended with a broad-cased consensus among participants for necessity for a free trade region in East Asia, taking some lessons from the experience of EU integration," he said. This free trade region would be characterized by substantial tariff reductions, ultimately leading to the removal of tariffs and simplification of customs procedures throughout the region, he explained. The Korean commissioner said many economies have come to realize that a key factor of economic growth and enhanced trade and investment is the removal of barriers and the creation of a virtually seamless flow of people, goods and services. "To truly reap the benefits that APEC promises, customs administrations need to work with business to develop a faster, better border — one that balances goals of enforcement and public protection with goals of facilitation and competitiveness," he said. Using the Seoul conference as a stepping stone, the KCS seeks to speed up its efforts to become the world's best customs service agency. To facilitate international trade and logistics flows through more advanced and streamlined Customs procedures, and to support the national vision of becoming the business hub of Northeast Asia, KCS launched in 2003 the World Best Customs Project, in collaboration with the private sector. The project is designed to implement overall reform in the customs administration by innovating clearance procedures, introducing a high-tech surveillance system, completing e-Customs and reforming work procedures. Last year, the first stage of the Project, the KCS selected 60 individual action plans and launched the project. "This year, the second implementing stage of the project, KCS will endeavor to accomplish substantial achievements in the Project to promote trade facilitation and security," Commissioner Kim said. "Specifically, KCS will step up its efforts in simplifying clearance procedures through the early accomplishment of Single Window system and Internet-based declaration system in order to create a business-friendly environment in Korea," he added. He stressed that the KCS would further strengthen international customs cooperation to facilitate trade and harmonize Customs procedures through the extended mutual administrative assistance agreements with Japan, the Netherlands, and India. KCS will also hold Commissioner meetings with major trading partners. Kim is also keen in developing trade facilitation action plan (TFAP) as spelled out at the first ASEM Senior Officials' meeting on Trade and Investment (SOMTI). The TFAP is aimed at the reduction of non-tariff barriers and of transaction costs, and at the promotion of trade opportunities. The TFAP shall provide the framework to determine thematic priorities and concrete goals for trade facilitation, to set guidelines for their successful achievement and to follow these through to implementation. The TFAP shall further provide a system for monitoring progress and for ensuring that partners contribute toward this progress in a balanced way, he said. Creating an ASEM data-base or virtual market-place will provide the business sector with easy access to comprehensive and up-to-date information on legal and administrative trade regimes of ASEM partners, on business opportunities, and on market trends, he concluded.